One of my favorite books of the last five years was A Man Called Ove. It was such a simple, beautiful tale that crafted a story about one old man set in his ways. I adored that book so much. The novel was written by Fredrick Backman, who also wrote this novel Beartown. The best way I could describe Beartown is as a more mature version of the NBC TV show Friday Night Lights. But instead of football, it's about hockey. And instead of being set in a small "football town" in Texas its set in a small "hockey town" in Sweden. The book opens up with gunshots and you don't know who is pulling the trigger and at whom until the end of the book. The book revolves around a dozen or so people from the town, intertwining their stories in what can only be described as masterful storytelling. Although there are a ton of characters in the book, Backman does such a great job describing each of them that I quickly was in tune with who was who. That's not something I can say about many books. Backman also is a master of coming in and out of people's lives at interesting but not always opportune moments. This isn't a book that has dedicated chapters for each character, he just weaves in and out of their lives. It's brilliant. Sadly a brunt of the book is about a hockey town where the inhabitants live and breathe hockey and that's it. It's a one-note town and I think that lack of depth hurts the book. I almost think that Backman made the characters a little too one dimensional. Some characters do end up evolving but it feels like this is Backman's chance at showing that although they're all from a small town they have more depth then it appears. 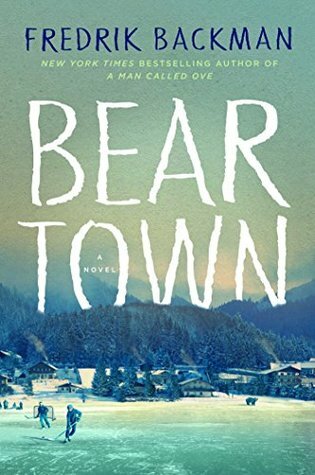 My biggest problem with Beartown wasn't the hockey, or the small town, or any of its characters. What bothered me about this book was that I just didn't find it engaging. It's well written but there's nothing about this story that feels fresh. It also deals with sexuality and gender in ways that felt clumsy. We get it, small-town folks can be small-minded, you don't need to beat us over the head with it. There's just something about Beartown that never clicked with me. There's a major conflict that happens at the halfway point and as horrific as it was, the conclusion to it was purposefully just as horrific. I know I'm talking in generalities but being any more specific would spoil the entire novel. I'll close out by saying that there was something about Beartown that just never clicked with me. I didn't hate the book but it's not one I'd ever go out and recommend.